Projects - Shanti Leprahilfe Dortmund e.V. Marianne Grosspietsch has initiated a number of projects with Shanti. They all contribute to helping those who find refuge at Shanti to find a new feeling of value and enable a life of dignity. Through their jobs, every Shanti resident makes an important contribution to maintaining Nepalese culture and helps to earn the funds to maintain Shanti. 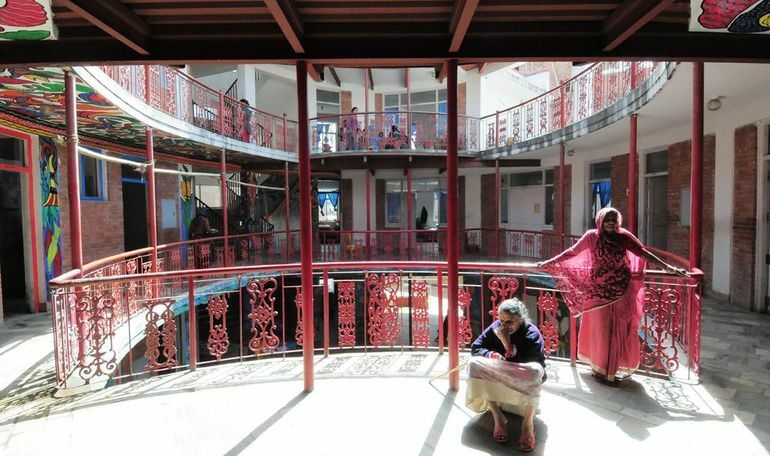 The arcades of the central courtyard of the clinic with their lovely wrought-iron balustrades. Wooden blocks are a wonderful toy! Studious pupils in the Shanti school. 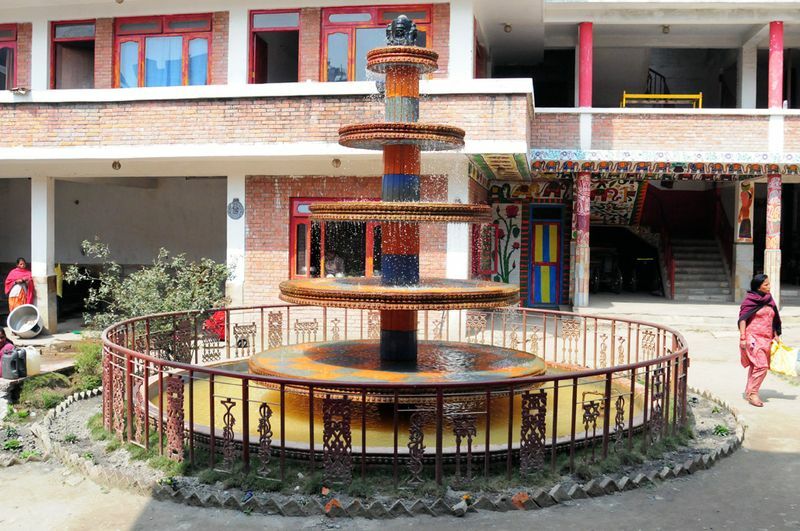 Clean drinking water from the Shanti fountain. Cabbage thrives in terra cotta containers on the rooftop terrace. 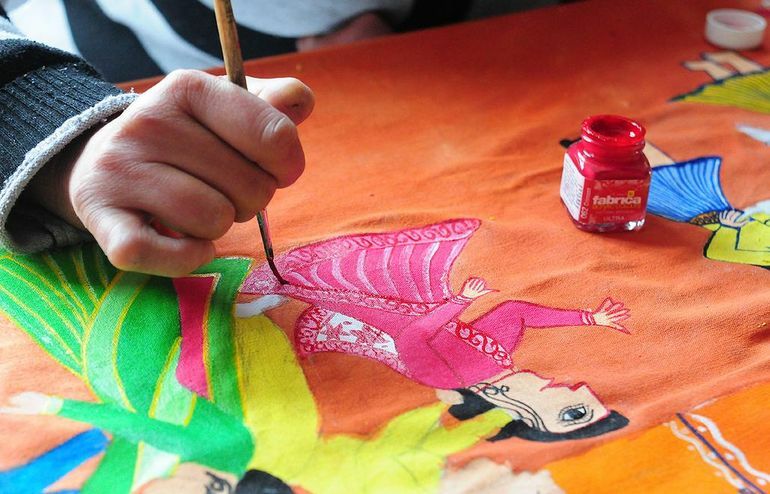 Colourful and decorative: Traditional Maitili painting. Leprous hands print colourful wrapping paper. 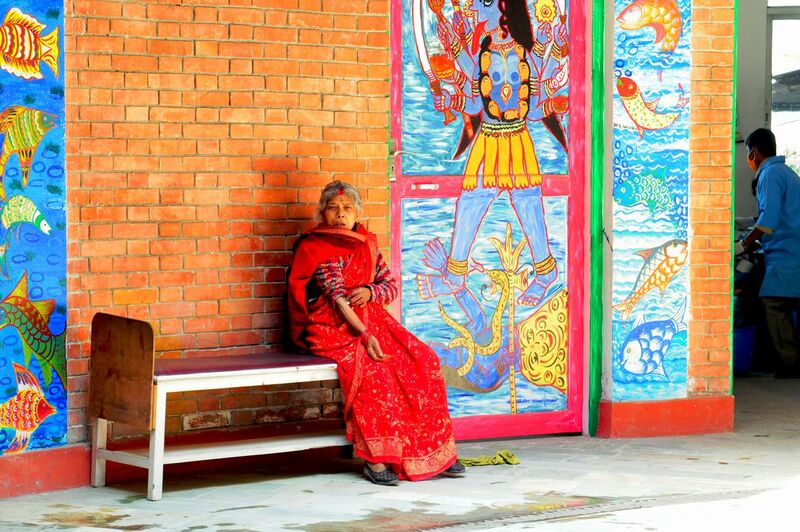 The core of Shanti is the clinic and outpatient clinic, where the ill and needy from all over the country, but primarily from Kathmandu, are cared and provided for. Those cast out by their families will find refuge here. The critically ill are lovingly cared for in the hospice, and Shanti ensures that those of Hindu faith – in accordance with their beliefs – are cremated in a traditional ceremony in the nearby Pshupathinath Temple after their death. 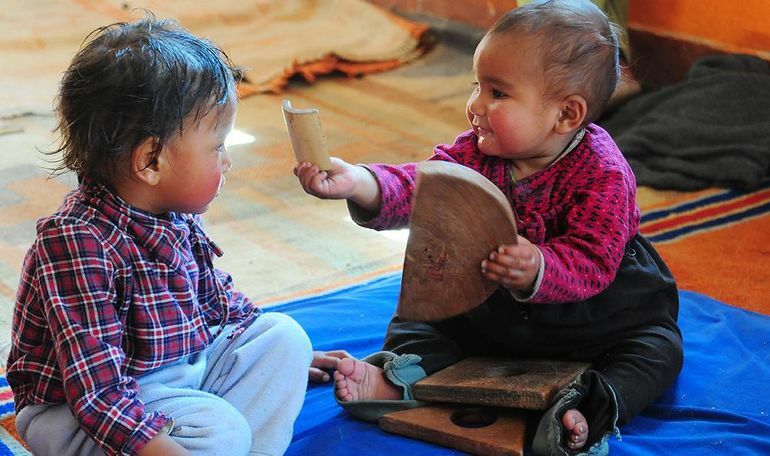 The little ones go to kindergarten, and older children go to the Shanti school for forms 1 through 5 before going to public schools in Kathmandu. A large fountain in the courtyard of the station in Kathmandu-Tilganga provides fresh, clean drinking water not only for the Shanti family, but for all the people living nearby. The food kitchen provides around 1,200 meals daily to the hungry, and of course all of the Shanti residents are fed here, too. 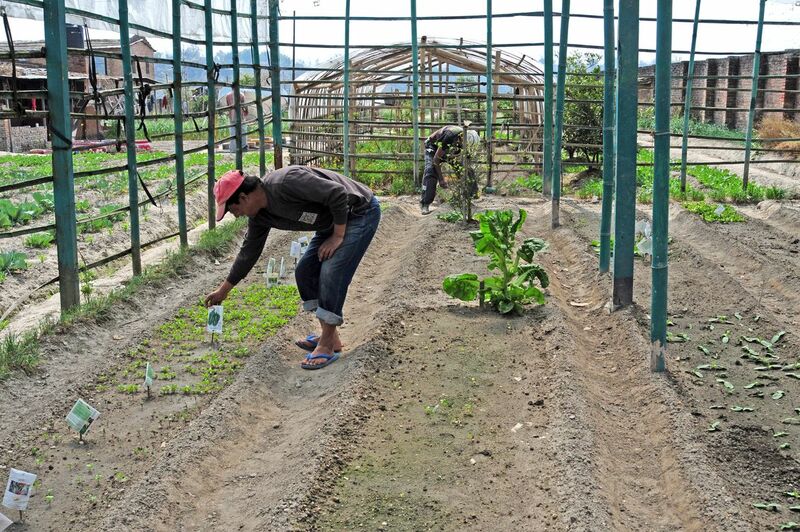 Most of the food comes from organic farming in Sundarijal, but in part from the rooftop gardens in Kathmandu as well. 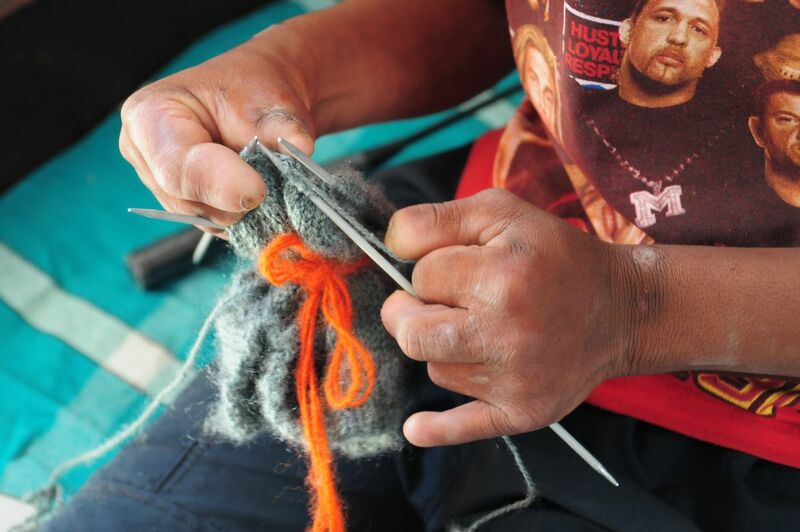 There are many different opportunities for Shanti residents to find work – according to their individual talents and interests. Even handicapped people can find valuable and meaningful roles that strengthen their feeling of self-worth. Such an outlook for people like these is unusual in Nepal, and it's a very important matter for Marianne Großpietsch that the people at Shanti feel valued and appreciated. 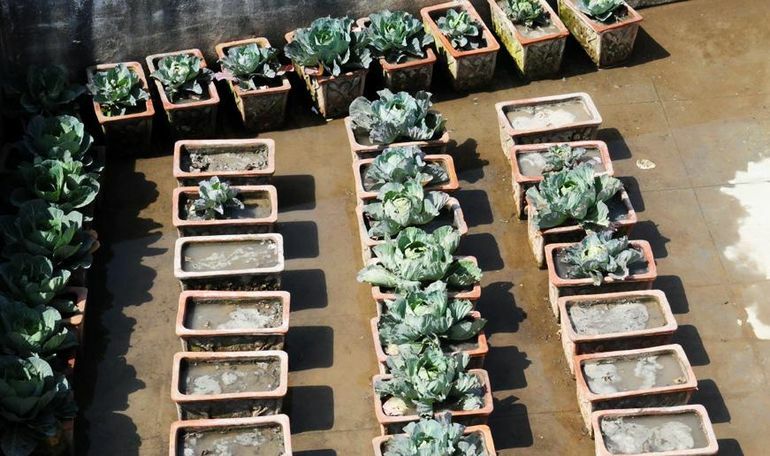 RECYCLING – EVERYTHING CAN BE REUSED! This is a major theme at Shanti. Resources are valuable, and lots of things can be reused or re purposed. For example, old tables, chairs and doors are restored in the carpentry workshop. Beautiful wrought-iron railings from demolished buildings found a new home in the Hape Kerkeling clinic. In the tailoring, old tyres are made into decorative bags, and old sheets that have been donated become practical shirts. Paper waste, when mixed with water and sawdust and allowed to dry, becomes combustible briquettes to fuel the open opens for the food kitchen. This way, Shanti doesn't need to purchase expensive wood. Nimble fingers use wool, silk remnants and felt to create decorative angels as Christmas decorations, which are sold in European markets during Christmastime. 100 percent of the proceeds go directly to the Shanti donation funds. 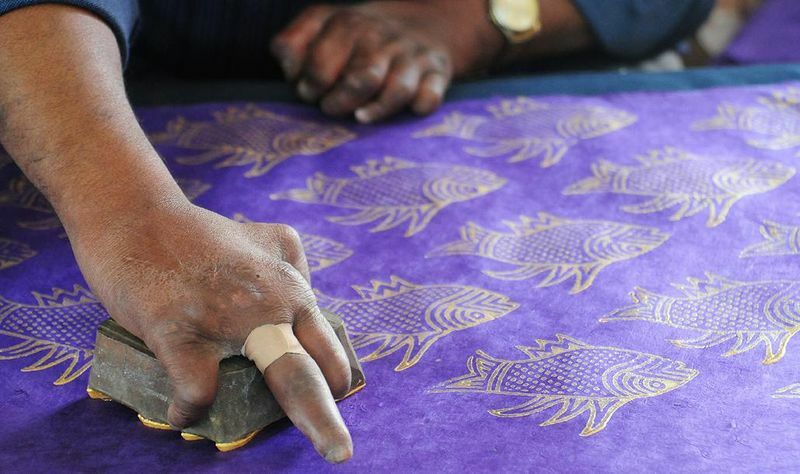 With extreme finesse, even hands left incomplete from leprosy can craft the most delicate pearl jewellery, print gift wrapping paper or do other paper crafts. 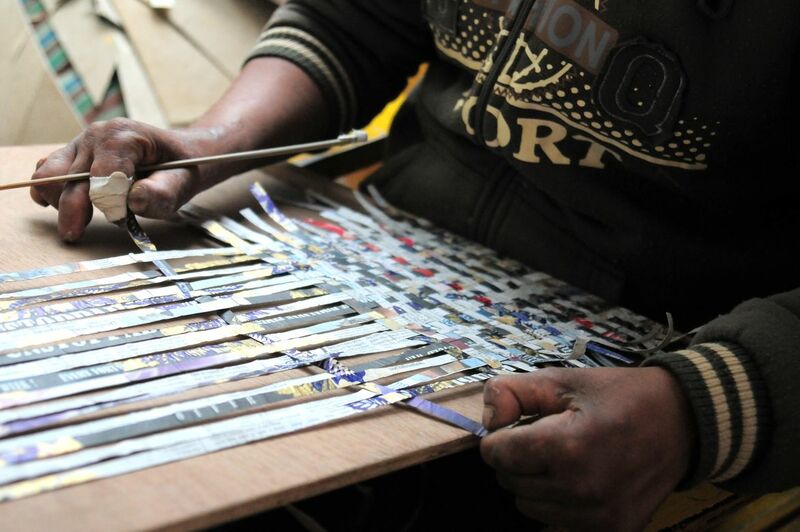 The silversmiths creates very beautiful jewellery, and skilled hands use silk wrapped around tiny rolls to weave artistic Dhaka shawls with traditional patterns.